Hurricane Pro – We are listening! We are listening! Hurricane Pro is changing to a similar format to the previous version, and keeping the speed for those that want to skip right to the map. 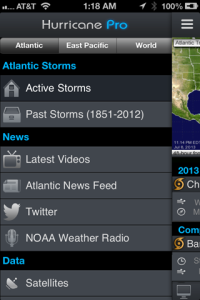 In the new version, we are changing the storm list slightly, making the information larger. Did you know that you can tap on the Outlook graphic to get detailed outlook information on the current area you’re watching? Swipe the outlook graphic “back” to see our highlights – usually watches and warnings, but could be anything we feel may be important to you. You can also swipe the outlook graphic forward to get more information – If there is an invest, you can see the percent chance it has of forming on the satellite map provided by the NHC. These graphics are independent of the list, but give a very quick view of what is going on in the area that is important to you! 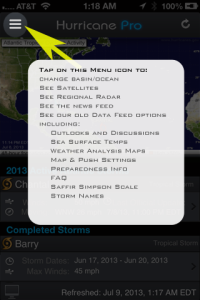 In the upcoming version 4.2 of Hurricane Pro, tap on the storm name to bring back the Storm Info page. We understand this was an important feature and we’re bringing it back so you can see the information as you did before. 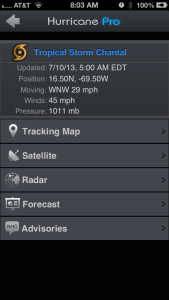 As you can see, the storm info contains the same information as previous versions with larger text for the information. In one of today’s reviews, the reviewer mentioned that they did not realize the icon at the top left of the screen was a menu. If you’re looking for the Satellites, Radar, and everything that was in our Data Feed page – Look no further! You just found it! 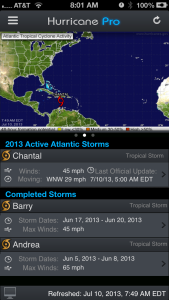 These are not the only changes we are making to improve your experience in our award winning Hurricane Tracking app. There are a lot of minor tweaks that will make the experience what our customers have come to expect. We hope our customers like yourself will like the new update that we are working very hard to complete and get into the App Store ASAP. If you want to see more sneak peeks at the upcoming release, follow us on Facebook and Twitter. We’re always using new builds to show you what is coming up!